What Day Of The Week Is December 13? 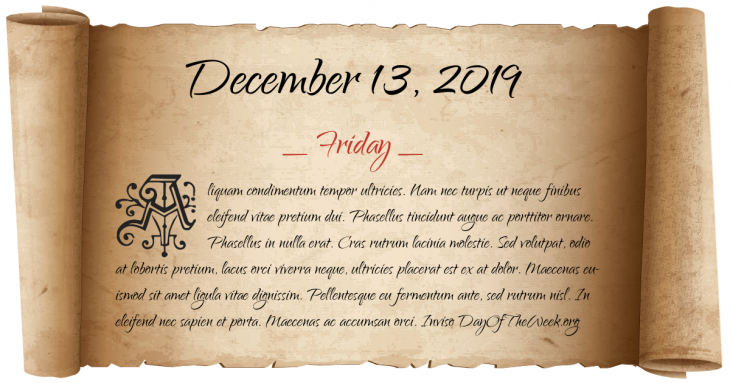 December 13, 2019 is the 347th day of the year 2019 in the Gregorian calendar. There are 18 days remaining until the end of the year. The day of the week is Friday. Fenian bomb explodes in Clerkenwell, London, killing six. Al Gore concedes the U.S. presidential election to George W. Bush. The “Texas 7” escape from the John Connally Unit near Kenedy, Texas and go on a robbery spree, during which police officer Aubrey Hawkins is shot and killed. Who were born on December 13?